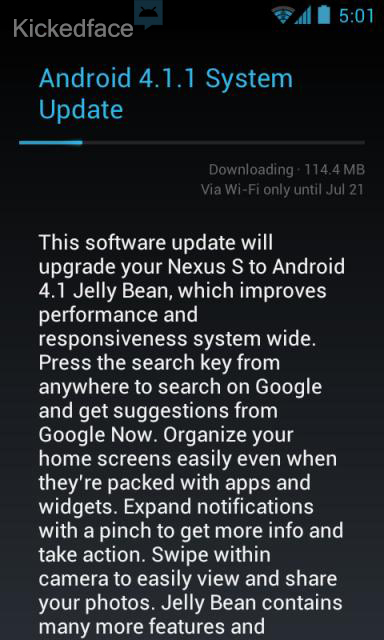 If you've been hanging onto your Nexus S, waiting impatiently for Google to start the roll out of Android 4.1.1 Jelly Bean to your device, you won't have to wait all the much longer. It seems as though the update is slowly rolling out as of right now. The update appearing shows as a 114.4MB file and is noted to of have loaded fine on several i9023 models as well as some i9020T models though we've not had much luck getting it load on our i9020T. If you're not wanting to wait for the OTA, you can download the zip file direct from Google servers though you may need to be running a custom recovery to get it on. (We used CWM 6.0.0.7 without any problems.) And of course, if you're unsure of how this all works best to wait until we get a full flashing guide up for you all.